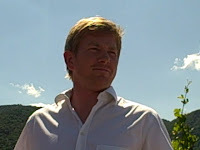 One of the most extraordinary wines I tasted in Austria—in a trip filled with extraordinary wines—was the Hirtzberger Riesling Singerriedel 2008. 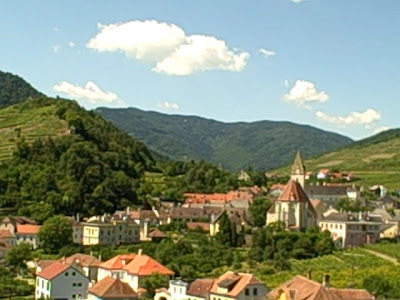 The fruit is grown on a steep vineyard in the Wachau town of Spitz, and shows all the characteristics that you would hope to find in great Riesling. The nose is amazingly complex, with notes of peach, nectarine, tangerine, mineral, mandarin orange peel, honey, and orange blossom. All of this leads to a palate of honey-drizzled oranges that evolve to summer peach, more minerality, and a hint of exotic spice. There’s a gorgeously subtle sense of perfume on the mid-palate that stays on through a finish that lasts for minutes. It’s still young, to be sure—this is a wine that promises 20+ years of evolution—but so perfectly balanced right now, showing such exquisitely calibrated acid, fruit, and mineral, that it is absolutely impossible to resist. My recommendation is to buy several bottles and follow them over the years. We experienced the Hirtzberger last Saturday morning at a tasting and lectu re on "Great Single Vineyards of Wachau" at Domäne Wachau in Dürnstein (more on their wonderful wines in a future blog post), and afterward had the chance to take a short bus ride to Spitz, where we were met by Franz Hirtzberger himself (that's him on the right), who led us on a tour of the Singerriedel vineyard. Take a look at the video below—it really shows how steep the vineyard is. And though it doesn’t quite convey the thinness of the topsoil and the rockiness of the land itself, it definitely provides a sense of place for the Hirtzberger Singerriedel 2008, one of the best Rieslings I’ve ever had the pleasure of tasting. The Hirtzberger Singerriedel is mind-blowing year after year. Great terroir + great wine making skill = bliss!